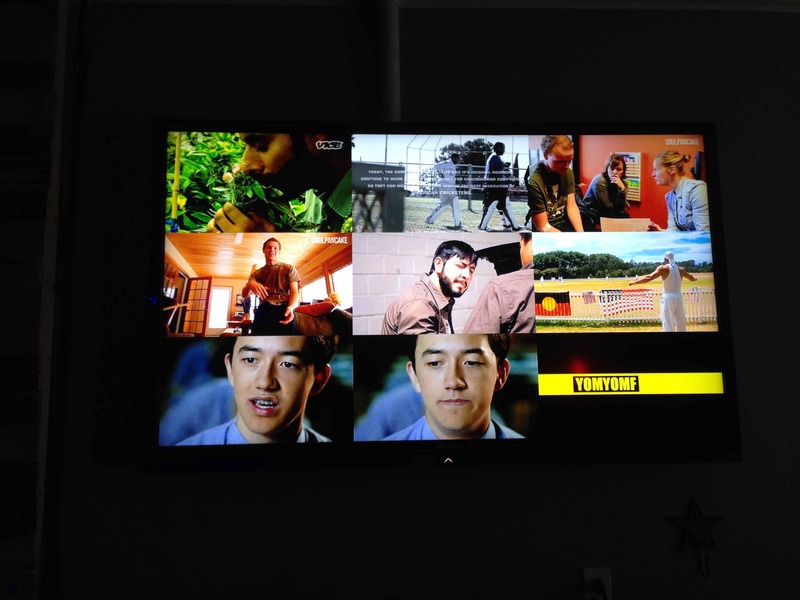 YouTube selects THE LANGUAGE OF LOVE for Sundance! We are thrilled to have been selected by YouTube to represent the best of indie film on the platform for the Sundance Film Festival, taking place from 16th to 26th January 2014. YouTube has made three two-minute teaser trailers that are airing before the festival’s short-film screenings. Each trailer promotes a short film already available on YouTube — ours, one from The Museum of Contemporary Art, Los Angeles; and the third from Zealous Creative. YouTube created the trailers to attract attention to its short-film library, and to get indie filmmakers, who might thinking about online distribution on YouTube, and advertisers, who might support them. “Most people don’t think of this amazing content when they think of YouTube,” said YouTube VP-marketing Danielle Tiedt. You can read the full story, over at Ad Age, here and check out the trailer below. It’s extremely exciting and an incredible honour to be chosen as one of only three short films from around the world to represent YouTube at Sundance. The level of audience engagement with the film continues to amaze me and it’s wonderful to now see The Language of Love being recognised by the wider film industry. 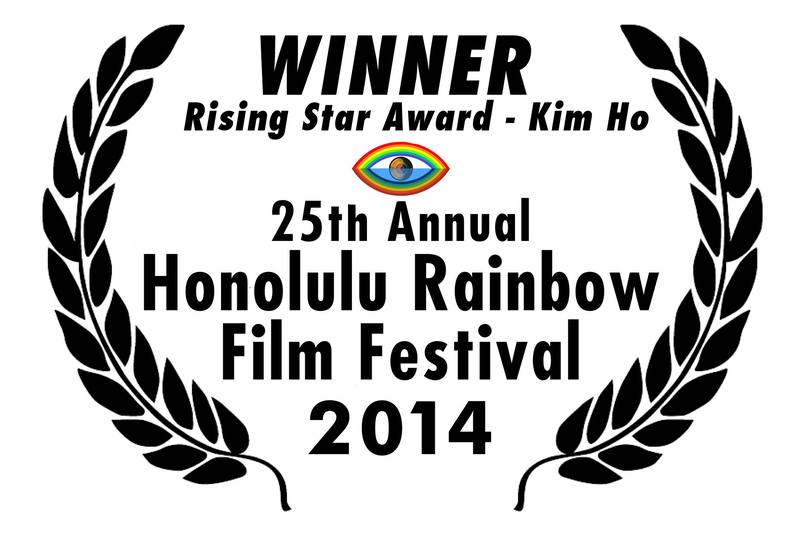 I’m thrilled for Kim Ho, The Voices Project and the entire team. Laura will be reporting about her adventures on the blog shortly. Meanwhile, watch the FULL film, here. An unexpected journey – looking back on a year of love. 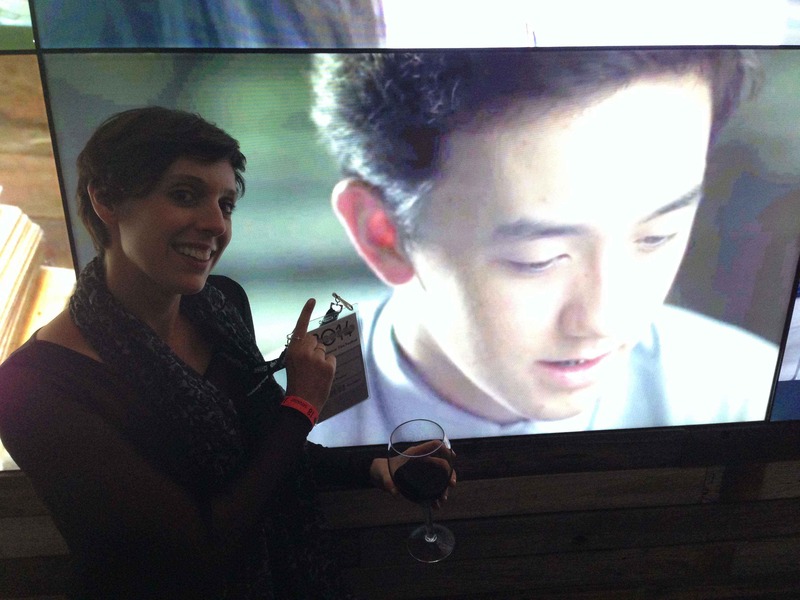 Kim Ho is the writer and star of The Language of Love. Here, he reflects on the journey he has been on over the past year. As its title suggests, The Language of Love is a monologue about the hazards and joys of communication. It’s a coming out story, sure, but it’s also about the courage to speak. As a young writer and performer, I am particularly aware that self-expression requires you to be brave and articulate. The monologue is essentially my attempt to understand how we can fly in the face of logic and find the strength to speak our minds. It’s perhaps ironic, then, that it all started life in Maths class. While my friends grappled with calculus, I was scribbling furiously at the back of the class. The goal: to submit something for an online writing competition from the Australian Theatre for Young People in Sydney. The brief: write, film and upload a three-minute monologue about love. The catch: I knew very little about monologues, and even less about love. But, driven by a potent mix of naivety and curiosity, my little piece, Transcendence, was taking shape. The original inspiration was a short advertisement for GetUp Australia called It’s Time; the message of equal love struck me as a very important and urgent moral issue. Just hours before the deadline, I hastily filmed and edited it together – a misshapen but optimistic take on a boy admitting he has feelings for his best friend. To my great surprise, the judges enjoyed my writing and Dan Prichard, Fresh Ink Manager and producer of The Voices Project, approached me with the idea of a mentorship with playwright Tommy Murphy. All I had to do, they said, was develop it into a longer work for filming. Nope: I battled hard, at first. My initial instinct was to try and use my monologue as an indictment of religious-based homophobia, but I couldn’t find the human message inside that premise. The breakthrough came when reading Tommy’s work. There was warmth in his writing that was immediately apparent and I devoured three plays in quick succession, crying and chortling my way through. Tommy treats his characters with a remarkable compassion and respect. Taking me on numerous strolls around Surrey Hills, he urged me to think of dramatic writing as an exercise in empathy. Theatre exists to entertain, I learned; it’s not a vehicle to lecture the audience on your own point of view. Start with a character, and let your story grow from there. And so Charlie began to take shape, with his own dreams, faults, quirks and, crucially, secrets. I wanted to make his story relatable to a diverse audience, so it’s less concerned with coming out than conquering fear – of exams, of expressing your feelings for someone, of losing your most trusted ally, of not knowing who you really are, and of facing the ridicule of a society that doesn’t yet accept you. 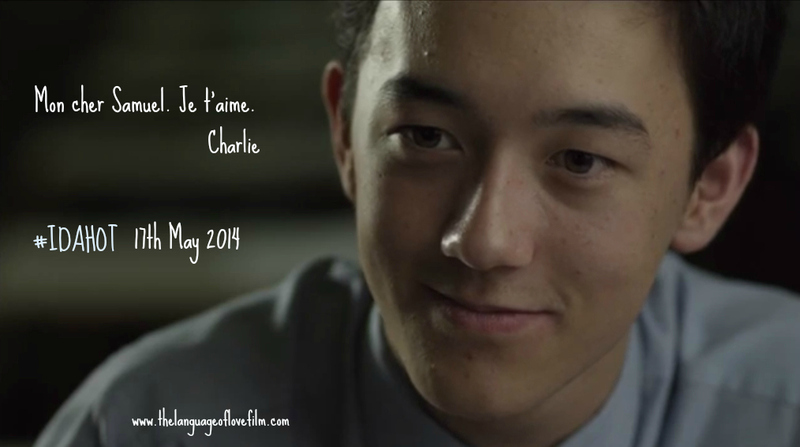 The monologue’s assertion that all love is equal rested on Charlie’s ‘relatability,’ so I wanted my audience to get to know him a bit before they discover his sexuality. He’s a person, not an issue, and I treated him as such. In tandem with writing, I was doing a substantial amount of research. I watched some teenagers’ coming out videos on YouTube and stood in awe of their bravery. One boy in particular showed an emotional maturity beyond his age: “Some people will be hating me… please don’t post it. Why are you watching this video if you hate it?” To my dismay, I learnt that this boy had been forced to take down his channel due to the amount of vitriol directed at him. He was only twelve years old. More and more, I knew that the film had the potential to do a lot of good, but I felt a responsibility to write something that remained respectful to the GLBTI community. Most importantly, I wanted to write something that would resonate with people regardless of their sexuality. Tommy helped me through six drafts before handing me over to our director, Laura Scrivano. We agreed that performing my own writing would be a challenge, but might make the piece seem that bit more authentic. 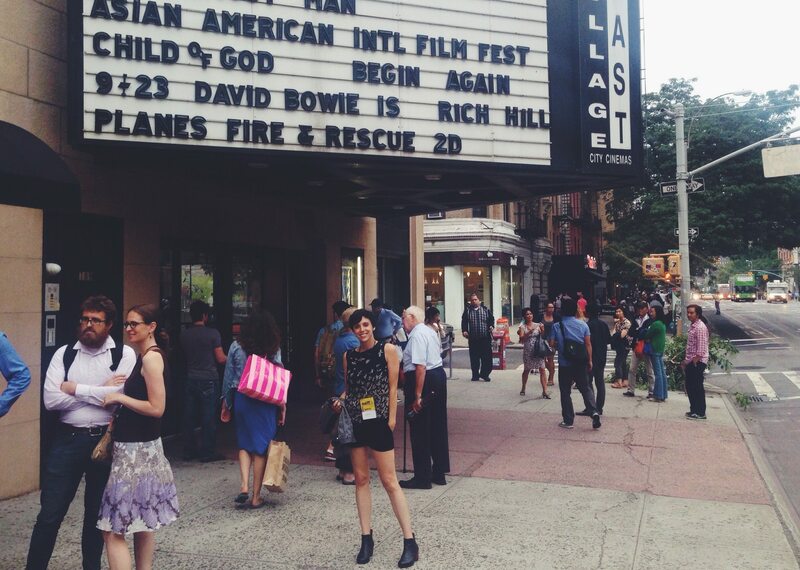 Laura is a performance-based director, and her process helped breathe life into the text. We found new rhythm and nuance I hadn’t been conscious of as a writer, fresh ways of looking at familiar phrases. Towards the end of January, performer, director and crew converged to shoot the film, now called The Language of Love, with a greater focus on French a metaphor for self-expression. 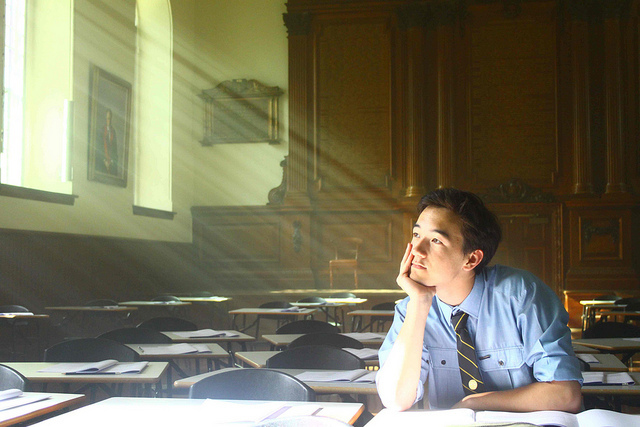 Tommy, Laura, Dan and I agreed unanimously on setting the film in an examination hall, agreeing that we could emphasise solitude by placing Charlie amidst a sea of empty desks. Tragically, when he needs help the most, he’s alone… except for the viewers. 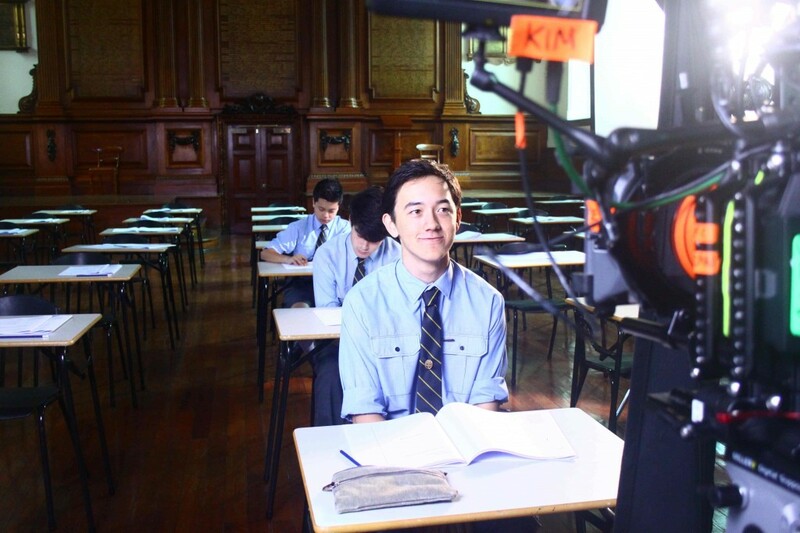 I persuaded some friends to voluntarily sit an exam with me in a big old hall at Sydney Grammar, and after eleven hours on set we wrapped, exhausted but content. The film was cut together over the next two months, and released in early April, 2013. We were lucky enough to have Sydney’s MP Alex Greenwich attend the première at the Australian, Film, Television and Radio School: a small but enthusiastic gathering of cast, crew and friends. But as the view count across YouTube agrew, we realised that the film was exceeding our wildest expectations. Stephen Fry was first. Tweeting the film resulted in so much traffic he crashed Fresh Ink’s website. ArtsHub and The Sydney Morning Herald increased that exposure. 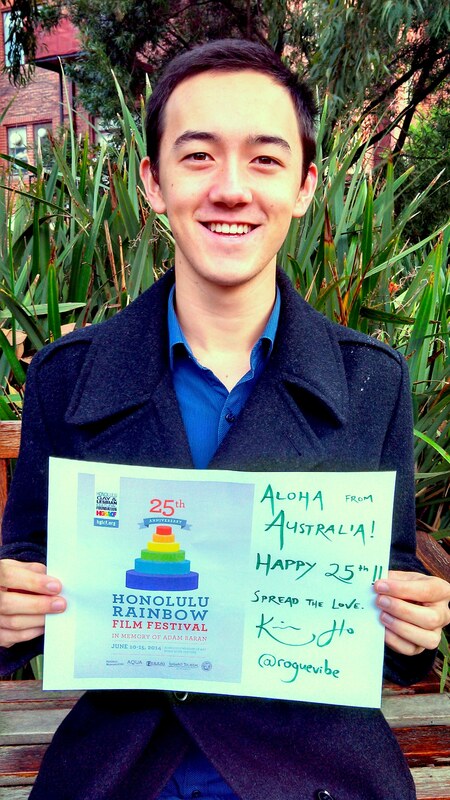 Sydney’s Lord Mayor Clover Moore and Danii Minogue joined in the support on Twitter. I got to speak on national radio in Australia and America. The film was mentioned in the Herald (again), leading US gay publication The Advocate, The Huffington Post, Buzzfeed and Upworthy. It screened at the Tasmania Queer Film Festival (before The Rocky Horror Picture Show!) and the Shanghai Pride Festival, and was shortlisted for Cardiff’s Iris Prize. 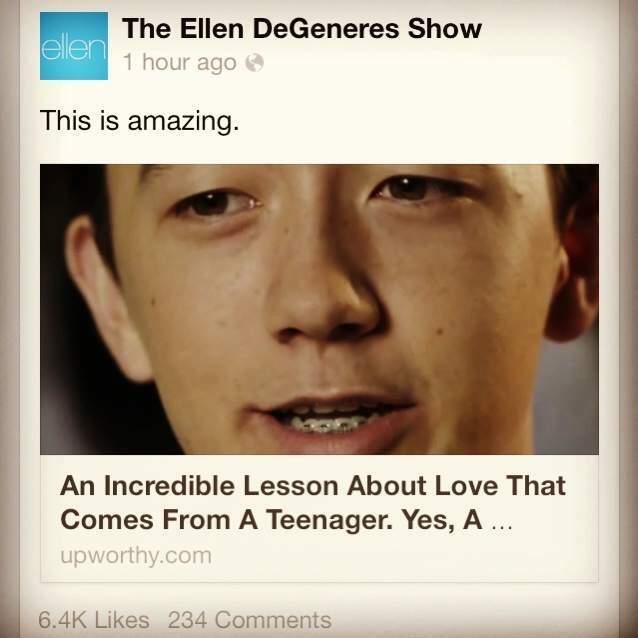 We’d almost finished off hyperventilating when Ellen DeGeneres tweeted the film, giving us 90,000 views in a day. I cannot begin to explain how proud (and completely surprised) the whole team feels when we look back at this journey. Most important for us, though, was the extent to which The Language of Love connected with people all around the world, particularly GLBTI youth. The amount of positive feedback floored us – viewers of all ages and sexual orientations commented that the film’s message of love, friendship and hope deeply moved them (see comments from our YouTube channel, here). In our own small way, we seem to have challenged heteronormativity and homophobia and started conversations about traditional perceptions of love. I hope that our little film – made on a tiny budget with a few, passionate people – will continue to share ideas of tolerance, acceptance and courage in the face of adversity. In fact, above all else, this process has taught me the importance of courage and having a go. Despite the monologue’s ambiguous ending, Charlie ‘wins’ because he confronts his fears. In a similar way, if I’d been too paralysed by my own inexperience to write Transcendence, I would have missed out on some monumentally groovy opportunities. Being a young artist affords a special type of impunity. Exploit it for all it’s worth! Write, act, film. More than anything, the artistic community rewards courage. So be brave. Take the plunge. In THE LANGUAGE OF LOVE, 17 year old Charlie struggles to find the words to be true to himself…and his best friend. Written and performed by Kim Ho and directed by Laura Scrivano, THE LANGUAGE OF LOVE is a wry, sensitive and moving account of a young man coming to terms with his sexuality and facing a life-changing decision. The film was written by Kim under the mentorship of leading Australian playwright Tommy Murphy, THE LANGUAGE OF LOVE was directed by Laura Scrivano as part of THE VOICES PROJECT from the Australian Theatre for Young People (atyp). 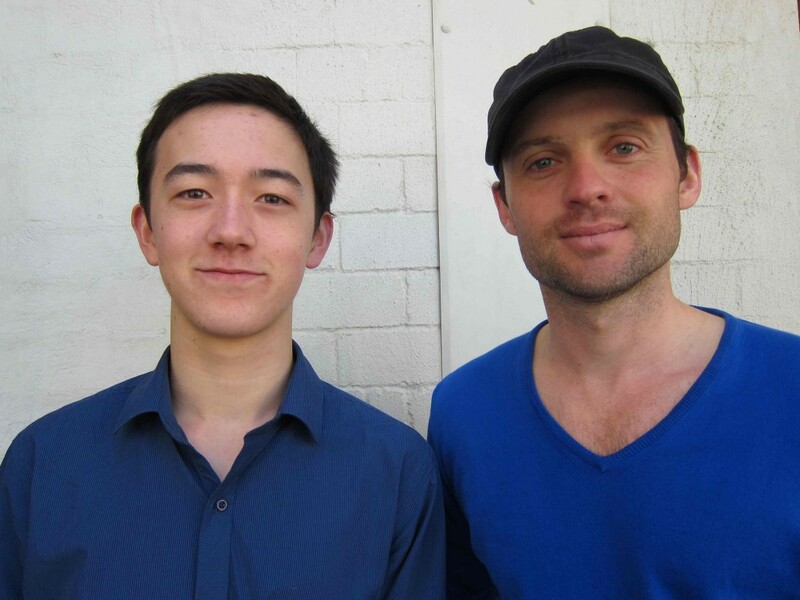 RT “@voicesprojectoz: 17 year old Kim Ho wrote/performs this beautiful monologue of a schoolboy coming out http://t.co/Pr0uVn5mYf ” AMAZING! Watch interviews with Kim, Laura and Tommy, below. Listen to an interview with Kim, Laura, Tommy and producer Dan Prichard, below. Listen to an interview with Kim on PRI’s The World, below. Watch Kim’s short piece TRANSCENDENCE, the inspiration for the film, below.